Available with us a wide array of Sev Gathiya Machine that is offered in diverse user defined specifications. Our deft professionals make use of finest grade raw material and latest technology in order to manufacture our offered machine in line with set market standards. In addition, this machine is meticulously inspected by our quality experts to make sure its matchless quality and durable finish. 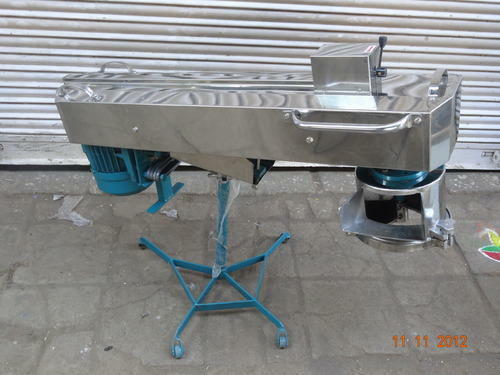 Established in the year 2004 at Rajkot, (Gujarat, India), we "Jayendra Engineering Works" are a Sole Proprietor firm and recognized among the noteworthy manufacturers and suppliers of a broad assortment of Roti Making Machine And Roasting Unit, Papad Making Machine, Namkeen Making Machine, Flour Mixing And Kneading Machine, Khakhra Making And Roasting Machine, etc. Our offered machines are assembled under the strict vigilance of our dedicated and hardworking professionals by making use of supreme grade components and innovative technology in strict adherence with industry quality standards. Owing to their long service life, hassle free performance, high functionality, rust proof, maintenance free and energy efficient, the machines are highly acknowledged among our honorable customers. Moreover, our offered machines are made available in numerous models and technical specifications as per the exact needs and necessities of our prestigious clients at highly competitive prices. We are providing our products under the brand name R-Smith.